HELLTOWN BEER: Major League Soccer: Irrelevant, Filler, Fleeting Tease??? Major League Soccer: Irrelevant, Filler, Fleeting Tease??? 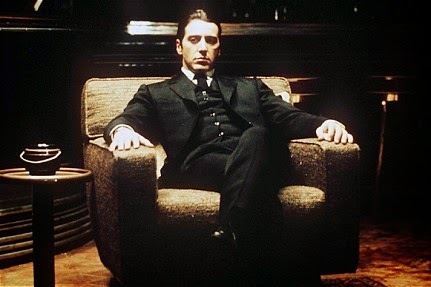 Photo: Al Pacino as Michael Corleone. From the movie trilogy The Godfather. You know the rest. Often associated with ruthless business endeavors, movies about organized crime and shady government fat-cats smiling over thousand dollar plates of pasta and truffles (while under the table calmly slitting the throat of the quixotic commoner), “and your enemies closer” carries much wisdom within its simple yet dark lesson. How might those few wicked words relate to the sport of soccer, and more specifically, Major League Soccer? Perhaps “and your enemies closer” teases the thrill of sporting competition. Or, maybe, the intimate touch of our sporting enemies, when brushing dangerously close to our physical and spiritual vulnerabilities, arouses pure ecstasy, heartbreaking misery and engages all our senses in an unavoidable cauldron of escapist dreamscape. Does Major League Soccer dare venture into the cauldron? Are the people guiding North America’s top league and professional soccer in the larger sense capable of grasping the meaning in the dreamscape of ecstasy and misery at the heart of our sport? Evidence suggests the guiding minds have, to date, only stumbled unknowingly and occasionally into the deep racing river of soccer’s blood-red arteries. The collection of rivals, sporting enemies, in the Northwest: Portland, Seattle and Vancouver, give a glimpse into what “and your enemies closer” might stir within the core of our sport. The intimate proximity of these clubs engages all our senses. More often, our soccer senses, our souls, are only fleetingly teased by those running Major League Soccer. In a part of the world where millions of children and adults play, the signing of a handful of formerly brilliant players brings with it a hollow and temporary dip into the coppery smelling river of blood. These “business” moves wreak of condescension. Their long-term effect is a net negative. The soccer soul knows the difference between the charlatan’s loud bark and the true call of the ball as it rolls under foot. Often, new cities and owners are chosen based on demographics, wealth and metrics which have little to do with what our sport is about. Worse, the devil’s plastic is given tacit approval despite the numbing effect it injects into the beautiful game. Those evil plastic fibers are one enemy to be shunned at all costs. Which enemies should North American soccer embrace? Which enemies enhance and grow our sport? Which enemies stir the senses? Start by embracing the regionalization of the top tiers of our sport. Expand the number of intimate rivalries. Professional soccer in North America would be better served by abandoning the East and West model. Create smaller regions, much like the Portland’s, Seattle’s and Vancouver’s existing in the Northwest. Arouse the beating heart by creating six distinct zones for professional soccer in North America. Example: The Mid-North: State a goal of eight teams in the top division. Cities like Columbus, Chicago, Minneapolis, Cincinnati, Indianapolis, St. Louis, Pittsburgh, etc. Play each team in your region home and away. Play each team in the Mid-South region (Texas, etc.) home and away. This accounts for thirty games. Play each team in one other region once for eight more games. The eight game region would rotate each year to add an element of competitive balance and fan curiosity over time. State a goal of having Promotion and Relegation within each region. Relegation will only begin after ten to fifteen years, in deference to the owners who started and built Major League Soccer into a sustainable top tier. Only those games played within a club’s region determine which teams go up and down. Cap the league structure at two divisions per region. Once relegation begins, three teams per region go down each year. The resulting turnover will guarantee incredible competition throughout the season. Continue to have playoffs and championship for best in the first division. Top two of each region, plus four best third place teams, make the playoffs. Playoffs are single elimination, quick and dirty, Sunday, Wednesday, Sunday, Sunday. Lastly, embrace the North American born player, regardless of heritage, and encourage in-depth, critical reporting on everything professional soccer in North America. Stop with the insular fear. “And your enemies closer.” There is much wisdom within this simple yet dark lesson. In soccer it arouses pure ecstasy, heartbreaking misery and engages all our senses in an unavoidable cauldron of escapist dreamscape. And, you never know, those businessmen, the ones who started the professional soccer ball rolling again in 1996, might just find monetary return beyond their wildest dreams if they let the heart of the game guide them.